Have you remembered that the second release of Sale-a-Bration items starts today? And there are some amazing items on offer. Take a look at the Catalogue Page for all the information, bu today I am sharing a project that uses the new Level 2 Bundle, which is FREE with an order of £90. The very special thing about this bundle is that the Textured Impression Embossing Folder is going to be in the new 2018-2019 Annual Catalogue, but for money, so get it now for FREE. I love both elements of the Bundle, but I am a bit of an embossing folder fan, so that is no surprise really. The stamp set is really pretty, and perfect for Mother’s Day (or Mothering Sunday as I will always call it!) 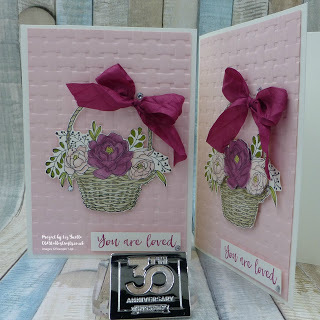 Add some Stampin’ Blends and you have some quick, easy and stunning cards. Level 2 Items!!!). For details of ALL the FREE Items, go to the Catalogue Page of my site. still become a VIP Reward Member. 31st March 2018 and you will get even more in your Starter Kit.